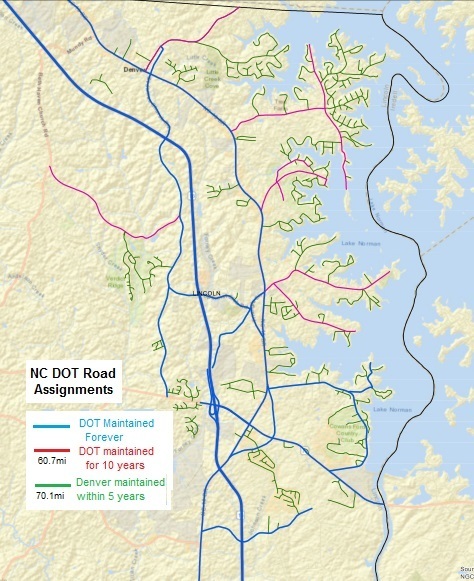 NC DOT will continue to maintain the blue roads indefinitely. Denver can take over the green roads in the 3 - 8 year time frame. Denver can take over the red roads in the 9 - 12 year time frame. Denver will receive Powell Bill funds (local share of state gas tax) for maintenance. The Powell Bill was ratified in 1951 for the purpose of having the state of North Carolina fund the building and maintenance of major city streets. A portion of the gas taxes for fuel purchased in North Carolina is placed in the Powell Bill fund and distributed to the North Carolina Department of Transportation (NC DOT) and eligible municipalities to fund maintenance and construction of roads. Taxes currently spent on gas purchased in Denver are used by the NC DOT and other municipalities to construct and maintain roads throughout the state. Incorporation of Denver allows the utilization of these monies to support the roadway system EXCLUSIVELY within the boundaries of the Town of Denver. These monies can be used locally rather than all across the state of North Carolina. The NC DOT currently maintains and constructs ALL of the roads in the proposed Town boundaries. They will continue maintenance for the highways (NC Hwy. 16, NC Business 16, NC Hwy. 73) plus designated connectors: N. Little Egypt Road, St. James Church Road, Campground Road, Will Proctor Street, Rufus Road, Optimist Club Road, Triangle Circle, N. and S. Pilot Knob Roads, Hagers Ferry Road, Club Drive, Sifford Road, Old Plank Road and N. and S. Ingleside Farm Roads. Subdivision roads can be transferred to Townmaintenance over three to eight years. Major connectors to subdivisions can be transferred in years nine to twelve: Unity Church Road, Graham Road, Fairfield Forest Road, N. and S. Golf Course Drives, Burton Lane and Webbs Road. The Village will receive a share of the state gas tax revenue to help provide for maintenance. The Village could construct small connector roads and improve intersections. An initial list would include five emergency (gated) access connectors to lake peninsulas that have a single point of access, a Denver Drive to St James Church Road connector, improved traffic lights at Walmart and Lowes and a part-time traffic signal at Galway Lane and NC Business 16 (Lincoln Charter School). More capital funds, as available, could be contributed to NC DOT to speed up planned improvements. Examples include widening N. Little Egypt Road/St. James Church Road to three lanes and an added eastbound lane from East Lincoln High School to NC Hwy. 16. Street lighting could be added at key intersections to improve visibility.